Is the Razer Tartarus V2 supported by Synapse 3? Yes, it is supported by Razer Synapse 3. 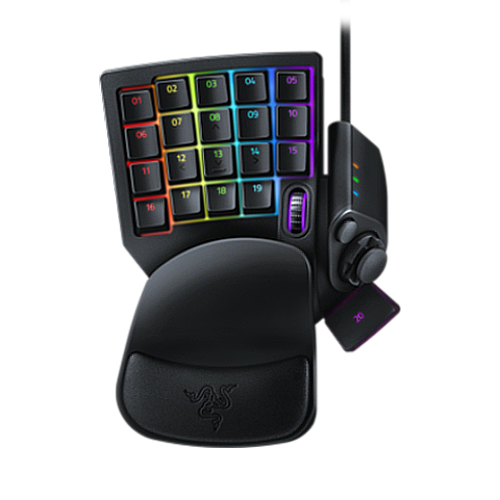 What type of keys do the Razer Tartarus V2 use? The gaming keypad features Razer's mecha-membrane keys, a soft cushioned touch with a crisp tactile click. How does the Razer Tartarus V2 compare to the Razer Tartarus? The Razer Tartarus V2 is the successor to the ever-popular Razer Tartarus. It comes with additional upgrades and improvements to its predecessor: Razer mecha-membrane keys, additional row of keys, extra scroll wheel & ergonomic palm rest. Does the Razer Tartarus V2 have anti-ghosting capability? Yes, the Razer Tartarus V2's 32 programmable keys feature full anti-ghosting, also known as N-key rollover (or NKRO). This ensures that no matter how many keys you press down simultaneously, each and every key will still register as a command. What do the keys on the keypad represent? How can I change them to my preference? The default key mapping on the Razer Tartarus V2 is of the left side of a standard keyboard. The keys can be mapped to your preference with the help of Razer Synapse 3. What does the thumb-pad do? And how do the other buttons on the keypad function? The multi directional thumb-pad is used for navigation by default and the button placements above and below the thumb-pad are mapped to 'alt' and 'spacebar' respectively. All buttons can be customized to your own key bindings and macros. How many keymaps and profiles can I save for my Razer Tartarus V2? You can save unlimited gaming profiles for your Razer Tartarus V2; in addition there are up to eight(8) keymaps per profile available. You can switch between them on-the-fly during gameplay without accessing the driver software. The keymap LED indicator will light up to show which keymap is currently active. Do I need software drivers to use the Razer Tartarus V2? You may use the standard keyboard functions by simply plugging the Razer Tartarus V2 to any available USB port on your computer. However, you will need to download the software and drivers in order to enable advanced features such as macro recording and profile settings.